December 22, 2011, 12:04 PM · I’ve been thinking. The cost to get into a football game and a theme park are about the same. I love going to both, but which is better? As it turns out, theme parks win in a landslide, and here’s why. 1. You can wear a Disney shirt to a Universal park and vice versa without getting beer dumped on you or beaten in the parking lot. 2. If you want front row seating you don’t have to pay a higher price for your ticket all you have to do is wait a little longer in line. 3. Disney and Universal aren’t going to pack up and move out of town if the taxpayers don’t fund a new theme park. 4. You can use your season tickets to the theme park more than eight times a year. 5. You don’t have to stand in line to use the bathroom. 6. The pig snouts you will see in a theme park most likely will be on Hay, Sticks, and Bricks or Ham rather than 300 lb men wearing dresses. 7. There are no TV timeouts in theme parks. 8. A roller coaster ride is a great experience and not a season description. 10. Dumbo is a ride and not the beer-swilling, gas-passing, jumbo-sized person crammed into the seat in front of you. These are just a few of the thoughts that came to me. Anybody else have any? December 22, 2011 at 12:17 PM · I would pick a football game over Disney any day, but a day at Universal or Busch Gardens instead of two to four hours at a football game is my idea of fun. December 22, 2011 at 12:47 PM · Football, like all spectator sports, is boring and tedious to watch. There's only about 20 minutes of action in the entire football game. It's much more fun (and healthier) to play sports than to watch. Going to a theme park is a much more active experience than passively watching sports, so theme parks win in a landslide. December 22, 2011 at 1:07 PM · Flag on the play means a parade complete with a marching band is coming through. Beer is only(!!!) $8 ... at Universal. You can come back tomorrow and do the park again (or a different one). You can see the Lions, Tigers, Bears (oh my) and other teams REAL mascots live and in person all in one place. For the pro and college football games I attend in the Washington DC area leaving the parks at closing time is MUCH easier than leaving the stadium(s) right after the game. December 22, 2011 at 1:09 PM · You can buy a Mickey jersey and be fairly certain he is not going to be traded to 6 Flags or cut. December 22, 2011 at 2:04 PM · This was a fun read. Anytime it comes down to going to a bowl game or a theme park trip, well the theme parks always win with me(although my favorite college team rarely goes to bowl games). December 22, 2011 at 3:22 PM · Ha ha ha. Very original, Mr. Hillman. I'll still go to my Florida Gator games, but I'll never look at them the same way again! December 22, 2011 at 4:22 PM · Why not offer the opposite? Top 10 reasons why going to a football game is better than a theme park. 1. There are real stars in football, not some cartoon characters. 2. You get your fill after 3 hours, but in a theme park, it takes much longer. 3. You can enjoy the food while watching the game, but in a theme park, you have to finish it or throw it out before it gets good. 4. If a guy gets hurt, another replaces him, the game continues. At a theme park, a broken ride is offline for hours and may not return. 5. Mickey Mouse hats look great in the park, but ridiculous out of it. Team hats and jerseys look good everywhere you go. 6. Football team franchises are highly desirable are in most major cities. You can find theme parks in a few areas and Disney and Universal are only in Orlando and Southern Cal. 7. You can get a beer at a football game. Most theme parks don't sell them. 8. Tailgating is accepted in some football parking lots. Theme parks don't have such things. 9. The fans are willing to paying much more for tickets and memorabilia than any theme parks including Disney. 10. You can enjoy a football game at home. Impossible with a theme park. December 22, 2011 at 5:06 PM · Tim said: "5. You don’t have to stand in line to use the bathroom"
December 22, 2011 at 6:08 PM · Anon, I tailgated at Great Adventure once, there were about 8 of us. December 22, 2011 at 6:33 PM · Nice article, Tim. 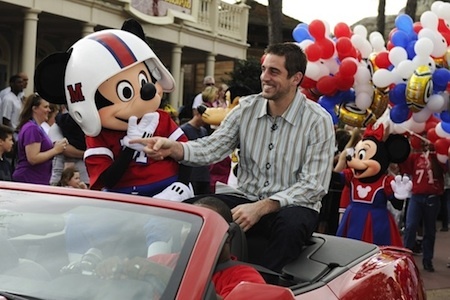 Question about the photo: is it really appropriate for Aaron Rogers to be asking Mickey to pull his finger? December 22, 2011 at 9:54 PM · This is something I don't know if anyone has really brought up..... a football game is basically a one time event during that year. That team (made up of it's current members during that season) will most likely only play the opponents that they play at a particular game once that year. Once for a whole year. Most Amusement Parks are open atleast half the year, so it may be a lot easier to move around your trip to an amusement park to a different day than without it drastically impacting you than it is to move around going to see a sporting event (which most people don't have the ability to move around the date of). December 22, 2011 at 10:26 PM · every football game is new, different, it's unscripted theatre and drama. even the best dark rides get old. December 23, 2011 at 12:19 AM · I love football but I would never actually go to a game because it is much more pleasant to watch on television: no unruly fans, no traffic, and significantly less chance of getting sick due to freezing temperatures. Also, I like both the Jets and Giants (go Jets this weekend though! ), and since they almost always play at different times, I can watch six hours straight on my couch. Also, if you plan, you pretty much know what you're getting at a theme park. Therefore, it is highly probable you will have a great time. If you go to an NFL game and your team loses..well you just wasted time, money, and potentially some sleep. And Anon Mouse: Is the lack of beer at theme parks really a detriment? I would think that if NFL teams did not serve beer, the crowds would behave in a more civil manner. December 23, 2011 at 6:58 AM · Inverse? Cheerleaders over the Princesses. December 23, 2011 at 9:07 AM · OK, Anon Mouse, looks like it is throwdown time. 1. An ill-tempered, bad smelling, pot-bellied, excessively body-haired guy in green saying ugly things at the Universal parks is called the Grinch. At a football game he’s just a typical Philadelphia Eagles fan. 2. The people pitching temper tantrums and acting like 2-year olds at theme parks are called children. At football games they call them wide receivers. 3. Tigger is the only theme park character flagged for illegal use of hands, and that was overturned upon review. 4. “Honey, I Shrunk the Audience” is a recently replaced ride at Epcot and Disneyland and not what the Cleveland Browns players tell their wives after appearing on primetime TV. 6. Astro Blasters is a fun dark ride instead of something that the center shares with the quarterback right before the snap after eating too much Mexican food the night before. 7. Lines are shorter at the theme parks when the marching bands are playing instead of longer. 8. If you wait in line for half-an-hour so your daughter can get her picture taken with a Disney princess, the women in your life will think you are awesome. If you wait in line for half-an-hour so you can get your picture taken with an NFL cheerleader, the women in your life will think you are scum. 9. Grown men don’t belly-bump at theme parks. 10. Men in Black: Alien Attack is the name of a great ride at Universal Studios Florida and not Sections 104-107 of the Oakland Coliseum during Raiders games. 11. People want to watch the Dolphins at the Sea World parks. 12. Santa Claus doesn’t have to dodge snowballs at theme parks.